Gleneagles Cottage is perfect for golf lovers and their families. It is an ideal base from which to explore Scotland's major cities, as well as having the picturesque highlands right on your doorstep. 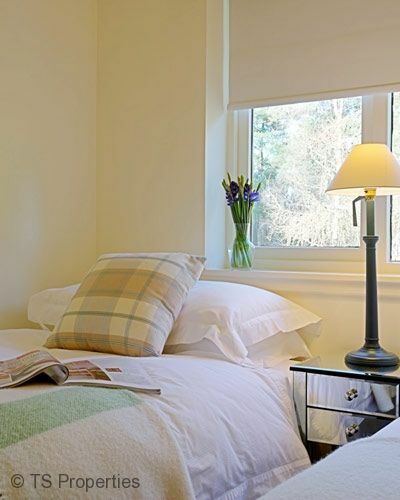 This privately owned, contemporary two bedroom self-catering cottage situated in the scenic grounds of the five star Gleneagles Hotel and Golf Resort. The cottage features a large living room with leather furnishings, widescreen television with Sky TV, DVD & CD players with DVDs & CDs, books and board games suitable for all ages. WiFi and central heating is available throughout. There is also a downstairs WC with toilet, wash basin and heated towel rail. The modern, spacious kitchen is fully equipped with electric oven & hob, integrated fridge with freezer box, dishwasher, washing machine & tumble dryer, microwave, toaster and cafetiere. The dining area seats 4 and leads out into the landscaped & furnished garden with secure external storage for golf clubs, fishing equipment, etc. Upstairs, the master bedroom has a super king size bed (can be split into 2x singles if required), double fitted wardrobe, chest of drawers and bedside tables with separate lighting. The second bedroom has 2x single beds and ample hanging space. A travel cot and high chair available on request. The modern family bathroom has a spa bath, power shower and heated towel rails. Please note, this is a privately owned holiday home so guests will be considered as 'non-residents' at Gleneagles Hotel & Golf Resort. Please contact the hotel directly for details and pricing. Gleneagles Cottage is a privately owned, modern two bedroom holiday home in the grounds of the famous Gleneagles Hotel and Golf Resort; home to the 2014 Ryder Cup. Sleeping up to 4 guests, it offers comfortable, well presented accommodation with a good selection of restaurants and activities nearby Sleeps 4. Bedrooms 2. Sky TV. WiFi. Parking. Garden. No pets. Gleneagles Cottage is lovely!! The owners have recently updated the property and it is fantastic! The little welcome ‘goodies’ are a nice gift. Robert and Kirsty met us at the property and ran us through the basics of the house. They explained about an issue with the hot water and said if we needed anything just to call. We did have a problem with the hot water but kirsty came out the next day to try and fix it. The house itself is in a great location. Private parking and 2 mins walk away from Gleneagles Hotel. The bedrooms are very well furnished, plenty of space for clothes. Beds are very comfortable. Kirsty left towels out but also explained that there were more in the cupboard if we needed. The kitchen has everything you need. The lounge is nice and big. Sofas are very comfy and there is sky and Netflix on the tv. Overall we had a lovely relaxing stay. Sleeps 4. Bedrooms 2. Sky TV. WiFi. Parking. Garden. No pets.